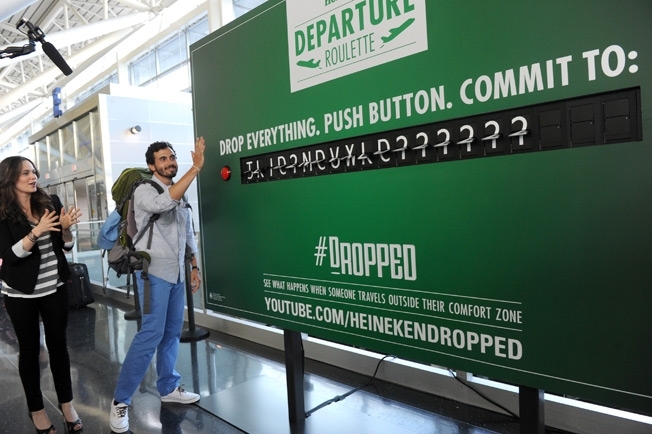 Here’s an airport stunt from Heineken that seems to embody the brand’s adventurous spirit. Twice this week they set up a board at JFK’s Terminal 8 and dared travelers to play “Departure Roulette”—changing their destination to a more exotic location with the press of a button. They had to agree to drop their existing travel plans—without knowing the new destination first—and immediately board a flight to the new place. On Tuesday, a man played the game and ended up going to Cyprus instead of Vienna. (He had been planning a six-week visit with his grandparents, but soon learned he would be headed to Cyprus on a 9:55 p.m. flight. Heineken gave him $2,000 to cover expenses and booked him into a hotel for two nights.) Perhaps Heineken should set this up in the Moscow airport. There’s a guy there who would welcome any chance to fly to oblivion.